So it’s the holidays, and you have been celebrating. Good on you! The eating and drinking has been going on for days and you deserve it. First there was Christmas, then leftovers, and plenty of alcohol and special festive snacks. You’ve had a wonderful time with family, relaxing and switching off for a much-earned break. You are feeling recharged….but a bit blah in your body from eating more abundantly that usual, and not moving so much and you want to get back on track with your health so you can feel good going into the new year. It is very tempting- especially at this time of year when being bombarded with dieting and detoxes galore- to go on an epic health kick, exercise like crazy and to try and starve yourself back to health. Before you start going down this route, let me tell you that this is the worst thing you can do. Not only will it not work, but it could leave you feeling worse than when you started. A much more effective approach is to simply get back to your normal lifestyle. This is really the best way to recover from the feasting. Trying to restrict or control your diet after relishing the freedoms of the past week will only make you feel stressed and anxious. The average adult requires between 7-9 hours of sleep per night. Not getting adequate amounts of sleep daily can lead to fatigue, dizziness, heart disease, and fat retention. 2. Eat organic and hormone-free! Organic and hormone-free foods are not always available, but when they are, it’s in your best interest to purchase these instead. Nowadays, restaurants are offering organic and grass-fed beef options. Shop at your local health food store and dine in at local family owned businesses. This also means, avoid greasy foods. Anything deep-fried is sure to wreak havoc on your body systems. The key is to eat clean! One of the easiest ways to incorporate loads of fruits and veg into your diet is through smoothies. I’ve put together a handy guide where I share 5 smoothies recipes that will also help with combatting stress and adding more happiness into your life. Download your free copy below. 3. Enjoy “you-time” at the beginning or end of every day. Decompressing after a long day at work is essential. Waking up in the morning 30 minutes earlier than usual for a sunrise meditation or yoga session is another great way to make time for yourself. Living an overall healthier life begins with your happiness and levels of stress. Dedicating just an hour or two to yourself every day is essential to promote lower stress levels and ensure your needs are being met! 4. Add more nuts to your diet. That’s right! Just make sure, as stated above, that you are choosing organic options. Head to your nearest health food store to purchase handfuls of nuts by the kilo- many nuts such as almonds and cashews are available organically grown. The fewer chemicals you introduce into your body, the better your body will function in the short and long term! 5. Drink the minimum requirement of water daily! Cutting on hydration can be the culprit for a lot of health issues including the onset of early aging, dry skin, and fat retention. Dehydration can also cause strains on your liver and processing toxins out of your body. Aim for 2 liters of water of water daily. Add sliced fresh strawberries and lemon to your water for a delicious and enjoyable treat. Take these 5 basic steps to living a healthier life and brighten your mood! There’s no reason to wait, start today! 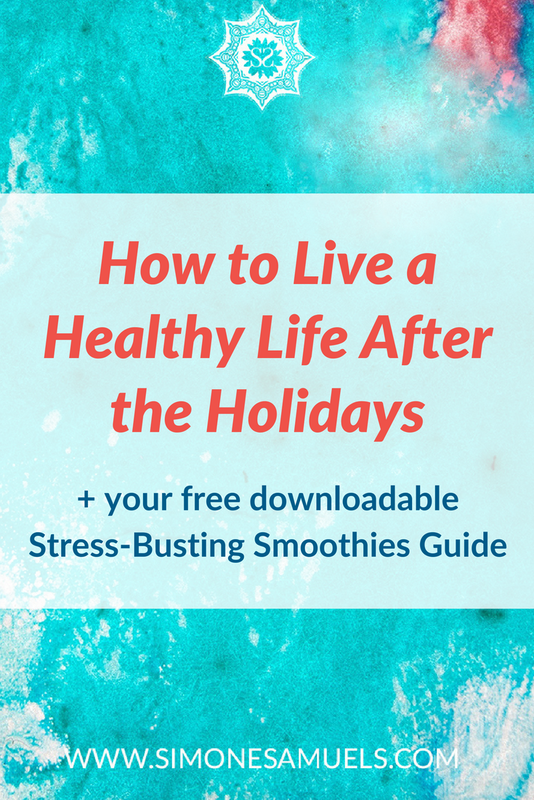 Don't forget to get your copy of the Stress Busting Smoothies guide which is packed with tricks for navigating this time of year without dieting. I'd love to hear how you went over the holidays and which of these tips you think will help you the most! Share in the comments!